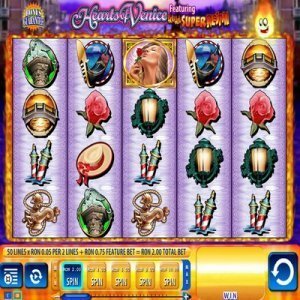 [miau] Hearts of Venice Slot Machine is a very exciting and unique game that is sure to please players of all types. To begin with, a basic description. The display has five wheels across with four symbols per wheel, meaning there are twenty symbols on the screen at any one time. The machine allows you to play up to 50 pay-lines. Venice is arguably the most romantic city in Italy, and maybe all of Europe. Its reputation has led to mimics and copycats, including an entire section of Las Vegas to be designed as if it were a canal in the heart of Venice. The Hearts of Venice slot machine includes classic images from Venice such as gondolas, gondoliers, an Italian woman, the Rialto Bridge, Red Roses and hearts. The music are classical Waltz and dances that you would expect to experience as you walked through Piazza San Marco. Hearts of Venice has fantastically designed symbols, graphics and music which undoubtedly were inspired by the enchantment of the city itself. One interesting feature is that as the wheels stop spinning all the hearts that were on the wheel turn into a different symbol, like a red rose or a blonde woman. It is important to note that this does not affect the chance to win as all the hearts on the reels turn into the same new symbol. In fact, instead of decreasing your likelihood of winning, this feature allows for the chance that you gain a new win after the wheels have stopped. Another special feature to the Hearts of Venice slot machine is called the “Hot Hot Super Re-spin.” This is the most frequently triggered win. The way it works is that if you spin and land a complete sequence of hearts on the first reel, the wheels all re-spin twice with all the Wilds locked in their place. This is the most frequent way to gain extra wins, which may double up with the guaranteed Wilds. The designers of the Hearts of Venice slot machine obviously took these intimate details of the city and culture into account as they made the game play and layout of the game. The symbols created for each wheel have a definitive connection to the city of love and romance in general. The second main feature is a round of free spins. This can be triggered by three or more Lovers Silhouettes symbols scattered anywhere. This land gains you ten free spins, which can continuously add up if you land on three Lovers Silhouettes again. Also the graphics of rose petals and the Waltz music is an entertaining touch. Along with the free spins potential there is a bonus guarantee included, meaning you can’t win anything less than ten times your bet size. The guarantee shows that this machine has plenty of opportunities to win big. The Hearts of Venice machine is filled with quality game-play features and a true sense that the designers cared about the players’ experiences. In order to play, a player needs to ante a wager, pick the number of lines to make active and push the button to spin. Hearts of Venice is sure to satisfy players of all types searching for some classic romance entertainment.